Over the last 3 weeks, we have been between Sevilla, Cádiz, Puerto Sherry (in Spain) and Toulouse, Lyon (in France). We were glad to spend time with our families and friends who took great care of us. We were very excited to see that our journey is inspiring them and we are really happy to share about it. It is good to see how my friends and family have become conscious about protecting the environment and now have more sustainable habits ; I can safely say that things were different in the past – even for me. Things are changing for the better. We got interviewed at Puerto Sherry by a local newspaper (Diario de Cádiz). This was a tiny article but I was glad I could get them talk about the pollution we encounter at sea. I spent 2 weeks with my family, my mother was glad to take care of us and I had time to see plenty of friends. I was alone with the kids while Pierre went to France and also spent days repairing/preparing the boat. We also spent some weekends together on the boat without the kids and some friends came over to visit us. The kids enjoyed spending time with my friends’ kids. Now that we are moving a lot, they are no longer shy and take advantage of all the time they can get with other kids. If you ever go to Sevilla, I recommend you visit la “Plaza de España”, the “Alcazar” and the “Cathedral”, that you get lost in the “Barrio Santa Cruz” and have some tapas in any bar (I can send you my short list if you want it) and spend one afternoon with the kids at “Isla Mágica”. Pierre went to France to visit his family (and meet his tiny new nephew!) in Toulouse and Lyon. 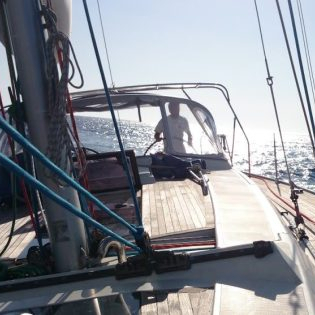 He rented a car and drove a couple of days to bring back a lot of stuff for the boat from there (ropes, dyneema and all-black lines, dyneema over-cladding, blocks, a new Facnor furler for the staysail, a water heater, etc…). We have to thank his parents for collecting all the shipments over the last months! After looking in local chandelries (in Spain, both physical and online stores), it was clear that the better deals were in France, especially during the “end-of-the-season” period. It was also difficult to find some specialised items (like the dyneema over-cladding or friction rings) over the last months – a refill was long overdue. We controlled the steering system and discovered bad spots. We got parts sent over from Jefa Steering in Danemark to fix it. We changed the spinnaker and staysail halyards, the vang line, the runners, etc. The dinghy got cleaned up and is now nicely packed in the lazarette. We had a great time in Puerto Sherry, especially with Nick and Jessica (and kids) from Ventus (we had met them in Puerto América in Cádiz), they took great care of Pierre while I was in Sevilla. Puerto Sherry being close to Sevilla, we got some friends visiting us too. We really enjoyed Puerto Sherry, it’s a lively place even at that time of the year. It really gets busy during the sunny week-ends and there is always something going on (sail races, weddings, people running around or playing padel, etc.). In addition of the boat repair services and chandelries, we had restaurants, bars and a small supermarket right next to our pontoon. In less than 30 minutes walking you get to another supermarket and a dental clinic (which we had to use, unfortunately…). It is also peaceful and quiet at night. Kids enjoyed the two beaches on each side of the marina. Car rental is available at the hotel on the marina, which is nice for sailors like us that don’t have a car. Most of the boats in the marina are from local passionate sailors. As frequently as they can, they sail around Cádiz’ bay. We received a warm welcome from the local sailing community and did a lot a nice encounters on the pontoons. After 20 days living on land, we were all missing being on the boat – which is a good sign 🙂 It was nice to be all together on Sunday. We are now ready to sail again! We’re now moving on to Portugal to visit a tiny bit of it and to get a second hand satellite phone for long passages.